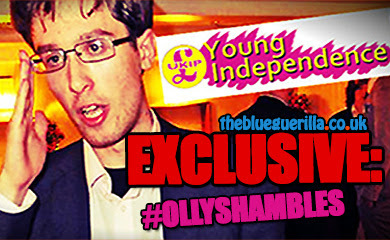 TheBlueGuerilla: EXCLUSIVE: Tory Journalist Denies 'Power Mad' Notts Uni Conservatives Coup Attempt. 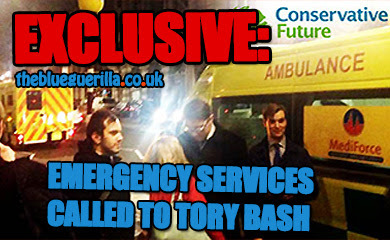 EXCLUSIVE: Tory Journalist Denies 'Power Mad' Notts Uni Conservatives Coup Attempt. NOTTINGHAM UNIVERSITY Conservative Association has been thrown into an all-out-war after accusations and threats of coups dominate proceedings, TBG can sensationally reveal. TBG understands a secret meeting was called last night for NUCA top dogs to discuss the Chairman's dramatic coup text threat, revealed yesterday on TBG. 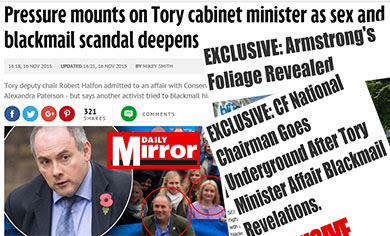 That has led to more dramatic leaks from within NUCA of messages between Chairman Huynh and journalist & rumoured leader of a secret clique to replace the Chair', Elliott Johnson, that show the current chairman willing Elliott to run for her position when the Chair's term ends. 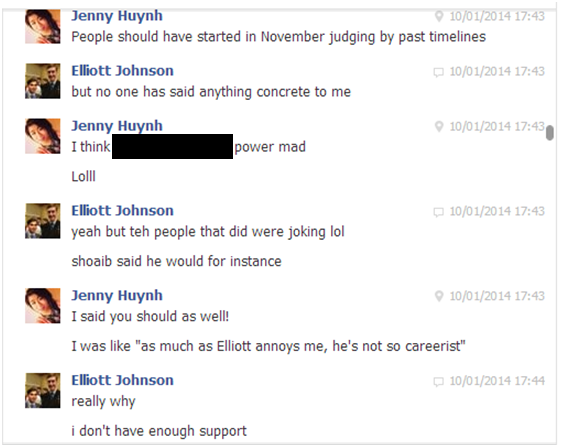 Huynh tells Johnson he "annoys" her but is not a "careerist". Messages also show the NUCA Chairman sensationally calling members "power mad". It has also been disclosed to TBG that a coup would take longer than the natural process to replace the Chairman, which is set to take place in March. In response to the ongoing leaks from NUCA Elliott Johnson first and foremost exclusively told TBG his favourite fizzy pop drink was "Coca-Cola". Elliott continued - "It is contradictory for me to launch a coup against the current President if she wants me to become the next one." "Sadly for those who like #sensationallyrevealing stories there is no truth to the fact that NUCA is looking into staging a coup against the President. For one thing we are having an AGM on 28th March and following the process of holding an EGM under the SU rules would mean we would have to wait to at least till April before it could happen. It's impossible to have a coup when the President's term has already come to an end." "Until 2015 I am only interested in my Blog and winning the 40/40 seat of Nottingham South, held by the Labour MP Lilian Greenwood. Although I did suggest to Jenny that if she could get me overwhelming support I would stand as President (something I knew she couldn't muster and was to me a polite way of telling her to go away and stop making these assertions). "I was recently appointed by the NUCA committee as campaign officer so there is joined up thinking between the University and Nottingham Conservatives. Jenny sadly was the only person to vote against this by by saying, "NUCA is a social society" and NUCA should therefore do no campaigning but I'm not interested in people trying to say petty things in university politics. We need a Conservative Government and I am spending much of my time trying to make this more likely. "The text that was sent said to take the idea of a coup "with a pinch of salt, as eavesdropping isn't fallible"; even the person who sent the text backtracked from the idea of a plot. 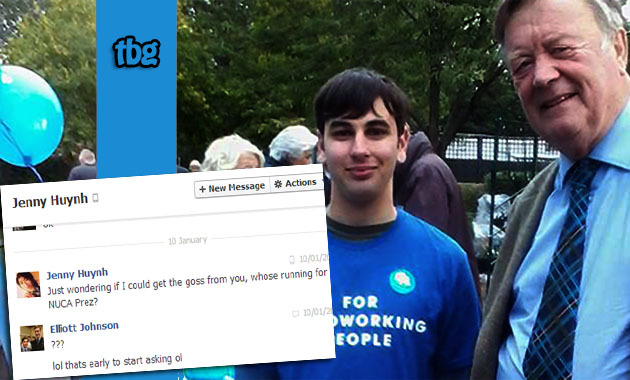 Whoever leaked the text should really get behind me and the Nottingham Conservatives to win Nottingham South. "It's a crying shame that this person has tried to create some unnecessary problems and equally so that the President seems uninterested in Nottingham South. 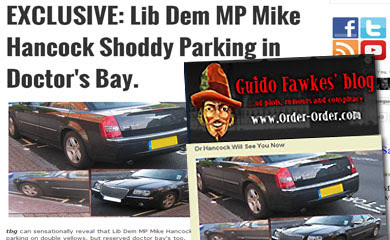 NUCA members are currently very much united behind the campaign to turf out Lilian Greenwood MP in Nottingham." "Keep up the competition TBG." And in the real world, no-one actually cares.